Cut the speck / bacon into pea sized lardons. Rinse the raw prawns and pat dry with kitchen roll. If you use fresh scallops they should not need to be washed. 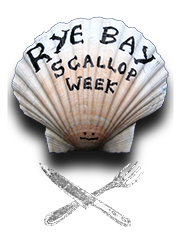 If you feel that you need to rinse them, do so swiftly and just before preparation – tap water is not good for scallops. Cut each scallop in half across the grain so that you have round medallions, try to leave the orange coral (roe) attached to one half. Pat dry if necessary with kitchen roll, lay out on a board and sprinkle with coarsely ground or crushed black peppercorns. Heat a couple of teaspoons of olive oil in a large, heavy pan – you can use butter in place of olive oil. The pan needs to be big enough to take all the scallop medallions laying flat, without overlapping (if you have only a small pan it is best to cook the scallops in batches). Turn up the heat in the pan so that the remaining fat and the lardons begin to sizzle. Evenly disperse the lardons in the pan and swiftly place in the scallops. Depending on the heat holding property of your pan, halved scallops take between 30 seconds and one minute each side to cook. If scallops are overcooked they become progressively tougher. I count to fifty from placing in the first one, then swiftly turn them all over in order for a further count of 50. They should by now have a succulent brown glazing with some of the lardons embedded. Immediately remove pan from heat and arrange scallops on the serving plate, sprinkling over any loose lardons, which should by now be crispy brown. 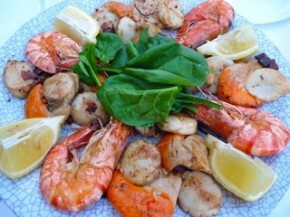 Arrange the scallops, prawns and lemon quarters and garnish with basil leaves. Serve with warm bread and lashings of butter, along with a decent Chardonnay … or, if you prefer a beer, draught Guinness or Hoegaarten Blonde.